60% Sloping Hill antibiotic and hormone-free ground pork, 40% Pemberton Meadows antibiotic and hormone-free ground beef. 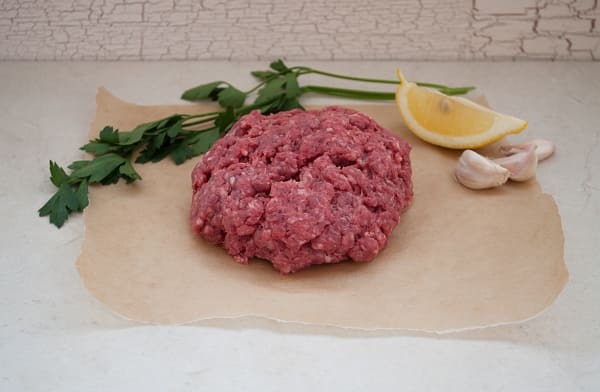 Lean and rich in flavour, this blend is great for making meat balls, burgers, or the traditional Bolognese meaty pasta sauce. Substitute pasta with spaghetti squash for a comforting fall dinner. This product traveled 12 km to reach our warehouse. Two Rivers Meats was started by Jason Pleym and his wife Margot in October 2007. The name was inspired by a song their friend Barney Bentall wrote for their wedding, called Where Two Rivers Meet. The Pleym’s pride themselves on developing relationships with local farmers who share their vision of how animals should be raised. They are a purveyor of fine meats including beef, pork and others that are free of antibiotics, hormones and chemical feed additives. In addition to providing the finest protein products available, their goal is to strengthen the connection between producers and consumers. They believe that people should know where their food is coming from and that it was produced ethically and naturally.